This is a 1932 Meteore (Pullman) #1 BF in Black Hard Rubber over a brass lining. Unsigned cap and barrel, other than “PATENT” on clip. Correct “D & D Paris 18 Cts 1” nib (Demley & Degan were the founders of La Plume d’Or, the French company which licensed the Pullman technology). This high quality, rare and famous pen, which opens and closes by pushing up & pulling down the barrel, which opens and closes the hinged crown on the non-removable cap. Few were made, fewer survived as folks broke them trying to unscrew the cap! Medium, extra-flexible nib. Near mint+. Shown open and closed. Item #16 in Catalog #83. 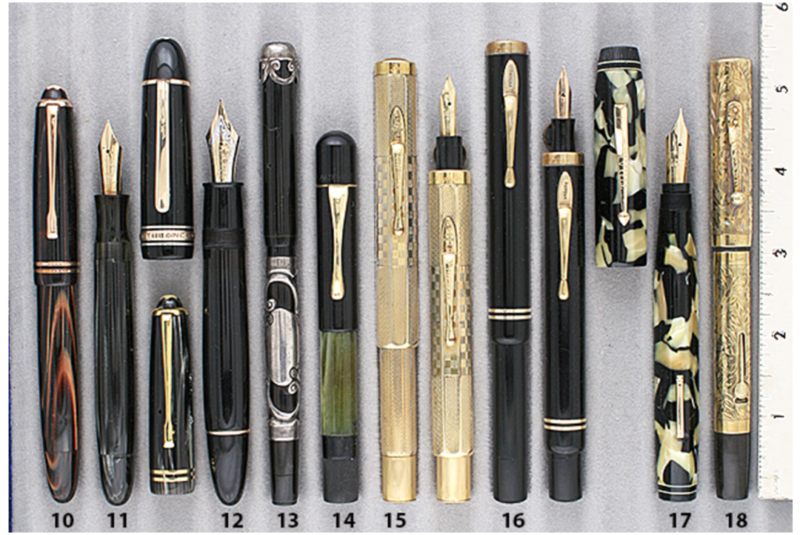 This entry was posted in Vintage Pens and tagged Catalog, Catalogs, Fountain Pens, Go Pens, GoPens, La Plume d'Ore, Pullman, Vintage Fountain Pen, Vintage Fountain Pens, Vintage Pen, Vintage Pens. Bookmark the permalink. Follow any comments here with the RSS feed for this post. Post a comment or leave a trackback: Trackback URL.